One of the most buzzed about new toys of the year has finally... hatched. Interactive creatures called Hatchimals are predicted to become one of the most wanted toys of the year, according to industry experts. Until now, parent company Spin Master has guarded the toy inside a large egg made from a hard material similar to plastic. The promise was that -- when the time was right -- a little creature inside would break out on its own. To get these eggs to hatch, kids must interact with its shell, which features touch technology. When you tap on it, the Hatchimal taps back. When you stroke the top or bottom, it lights up and makes sounds. 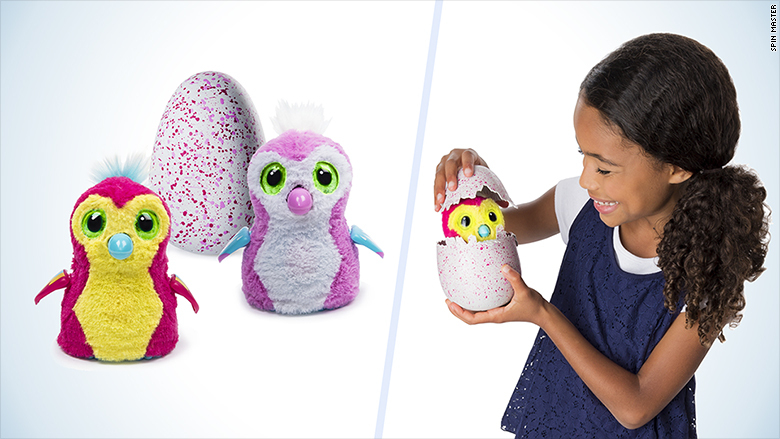 There are two families of Hatchimals -- Pengualas and Draggles -- and as the names suggest, their look is inspired by penguins, koalas and dragons. Each costs $59.99 and go on sale starting Friday. When they're ready to hatch (usually after 30 minutes of continuous play), it'll do so on its own. The Hatchimal pecks on the shell -- loudly and with force, rotating its head to strike at different spots. Eventually, the beak breaks through enough to lift the top part of the egg. "As far as we know, a toy that's able to hatch on its own hasn't been done before," said James Martin, head of Spin Master's robotics unit. A Hatchimal's behavior matures over a couple of days and weeks. It becomes a toddler and eventually, an adult Hatchimal. As a baby, you feed it by touching its beak to the floor. It becomes more interactive as a toddler. It'll dance, repeat your words and move when you clap your hands. The Hatchimal will play games with you in its grown-up stage. Spin Master is known for its innovative approach to toys. Two years ago, its robotic interactive toy Zoomer was hit among kids, followed by the success of Meccanoid -- a programmable walking, talking personal robot. The company said it took two years to develop the Hatchimals. This included selecting the perfect hatching time for each egg. "Kids don't have a lot of patience," Martin said. "We didn't want it to take too long [to hatch], but we also didn't want it happen too fast." It also wanted to avoid kids giving up on the toy right after it hatched. "We put a lot of effort into ensuring that the play went much beyond the hatching," Martin said. Unlike many other interactive toys in the market, Hatchimals don't interact with an app. "This was a conscious decision on our part," said Martin. "Kids already have a lot of daily screen time. We didn't want to add to it." Jim Silver, a toy industry expert, has already pegged Hatchimals as one of the must have toys of 2016. "Almost 20 years ago, we had the Tamagotchi virtual pet you had to hatch and take care of," he said. "Hatchimals is like that but brought to life." The company said it hopes to add more hatching creatures to the Hatchimals family soon.